You can see treasures from China’s cultural heritage that typically are not seen in museums and galleries at Artexpo New York at Pier 94 along the Hudson River. Huayuan Art, an offshoot of an organization founded 23 years ago in Gansu, China and devoted to the cultural development of Northwest China brings to the fair elaborate replicas of the Silk Road Buddhist murals and a live demonstration of Suzhou’s silk craft. Additionally, Huayuan will display other created through specialized craftmanship: lacquer paintings, Nepali Thangkas, multi-layered paper cuttings and traditional Chinese paintings. 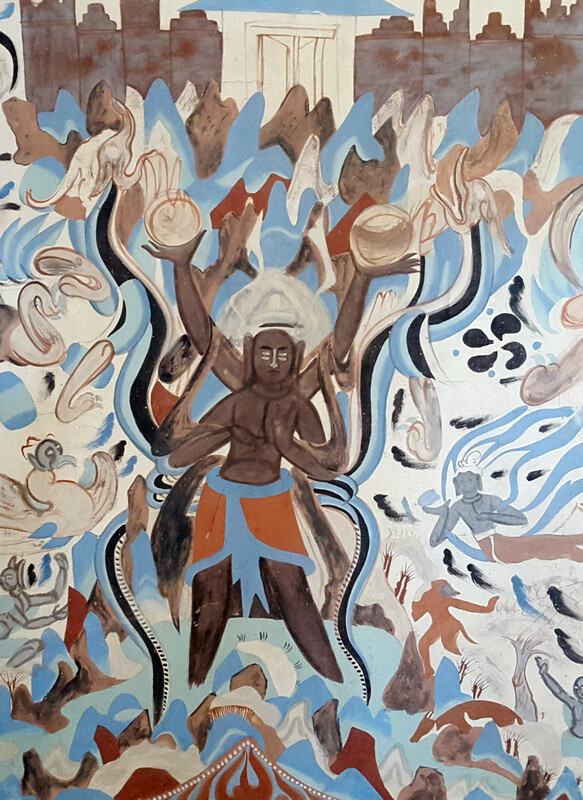 Huayuan will display 29 cave painting replicas based on murals from the famous Mogao Caves and the under-the-tourist-radar but equally exquisite Yulin Caves (榆林窟), and Maijishan Grottoes (麦积山石窟) that were hand-painted by Chinese artists Gao Shan, Shen Yongping, Liu Junqi, and Shi Dunyu. These caves, with their exquisite wall paintings and sculptures, bear witness to the intense religious, artistic, and cultural exchange that took place along the Silk Road—history’s most famous trade route linking East and West. The replicas are painted with traditional cave painting techniques, and authentically represent the current state of the caves, without hiding damage and conservation efforts. The replicas also show the lacquer painting techniques which are typically associated with Chinese and Japanese lacquerware. In one highlight, Acolyte Bodhisattva on the North Side of the Buddha, artist Ma Ke uses natural lacquer, along with gold, silver, and other mineral pigments, to portray a standing Bodhisattva statue from the Mogao Caves with an elegant composition and lustrous finish. With a slight smile playing upon his delicate face, this bodhisattva is one of the most distinctive and oft copied images from the caves. In addition to these frescos, other sacred art on view includes Huayuan’s collection of thangkas, Tibetan Buddhist paintings on fabric that depict deities, and mandalas and visually describe a deity’s realm. Traditionally, thangkas are hung in monasteries or upon family altars, and are carried by lamas in ceremonial processions. Originally designed to be portable mediums of spiritual communication and guides for visualization of deities, thangkas still hold great spiritual significance with Buddhist practitioners. The name thangka is derived from thang, the Tibetan word for ‘unfolding’, which indicates the ability to be rolled up as a scroll when not in use, or for transport. Every piece is hand-painted by Nepali lamas, with natural mineral pigments on fabric, each taking several months of meticulous work to complete. Finally, Suzhou embroidery, the most celebrated style of Chinese silk art will be showcased through the works and a live demonstration by nationally recognized master artist Wang Lihua. This art form is one of four main regional styles of Chinese silk art and is renowned for its use of the finest threads, elegant colors, dense stitching, and smooth finishes to create incredible detail and subtle lighting effects on stunningly realistic images reminiscent of oil paintings by the Dutch masters.